Meet the omnibus. Introduced to New York around 1830 and regarded as the city’s first mode of mass transportation, this 12- to 15-seat oversize stagecoach regularly ran up and down Broadway between posh Bond Street and the Battery. 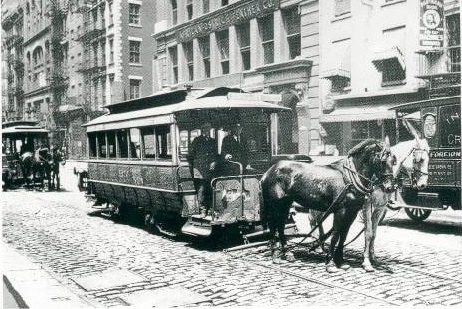 Next on the mass transit horizon was the horse-drawn streetcar, debuting in in 1832 on Fourth Avenue in Manhattan. These vehicles “rode along embedded iron or steel tracks, [and] were designed to carry more people and offer a smoother ride than omnibuses,” states the Transit Museum website. Omnibuses and horse-drawn streetcars were eventually edged out by elevated steam trains, electric trolley cars, trolley buses, and subways when it came to getting around the city. The last horse-drawn streetcar line, the Bleecker Street & Fulton Ferry Line, pulled into the intersection of Broadway and Bleecker (above) its final time in 1917. This entry was posted on October 27, 2011 at 4:48 am and is filed under Lower Manhattan, Transit. You can follow any responses to this entry through the RSS 2.0 feed. You can leave a response, or trackback from your own site. I like that my dad, born in 1917, ushered in the modern age of trolleys. He was an aficionado of the subway system and knew where to stand on every platform to make the right connection or be in the correct spot for a particular exit at whatever station one was headed toward. I suppose Google can do that now, but not with the same personality. At least we still have some cobble stone streets on the Lower East Side and trolley tracks exist in parts of Brooklyn.